I wrote about some of the features and some of the problems with the Permobil M300 a few posts back (Permobil M300 Update) but rather than go back and insert photos, I just though I'd reiterate my frustration here in a new post. Since that post I have heard from others (electronically & verbally) with similar Permobil problems. The Permobil M300 is a good looking chair - that may be its best selling feature. Headlights, turning signals, hazard flashers -wow. While my understanding is that these are mandatory in Europe. not so here in Ontario, Canada. So, they are wired but not connected. To save money, I was told, they order one model of joystick/controller from the manufacturer in China, and then mount this standard unit on every model of chair where appropriate. Here is the Permobil 300M controller that came with my chair. It has an inoperable headlight switch, hazard flasher switch &turn signal buttons in addition to the standard on/off switch, an power selection switches. The standard switches are operation but I was told that to activate the other features would cost an additional $1000 Cnd. The are partially wired or powered already as they indicator lights within the switch will light up when activated unintentionally. This can be distracting when activated unintentionally, momentary thinking some error has occurred. 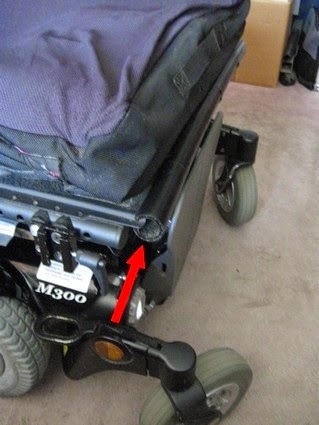 (Above) Nonoperational headlight/reflector found on the Permobil M300. (Below) Rear reflectors & turn signals. Turn signals are also nonoperational. While required by law in Europe, it is optional where I live and costs an additional $1000 Cnd to activate if desired. A money grab no doubt - a thousand dollars to turn the lights on, really? *See note at bottom of post regarding further explanation of the lighting system/reflector issue. When I was first considering purchasing the Permobil M300, I was concerned by the rather flimsy side arms. They had a side to side displacement of up to 2 inches (5 cm) -that is up to 1 inch or 2.5 cm to either side off center. If you have limited use of your legs, naturally you compensate by using your arms. Hold the arm to stabilize and shift your bottom from the surface you are on, to the chair. The Permobil sales person observed how I transferred but raised no concerns. I however was concerned and pointed this out. The salesperson assured me that the arms were strong enough for my use but that in three months a new model, under development, would be released. He promised that I could swap out my arms for these new ones that would be "rock solid" (I remember his description) at no charge. I asked that this be written on the sales invoice. I have subsequently learned that Permobil only has two arms for this model chair and both were available at the time of my purchase. There was no "Rock Solid" are being developed. I feel this was an outright lie to make the sale. The arm rest is attached to the frame by means of a single square post that is attached to a curved bar. 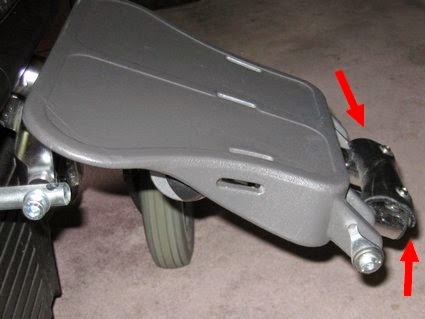 The bar itself has a hinged attachment at the lower rear of the seat pan near at the a backrest. 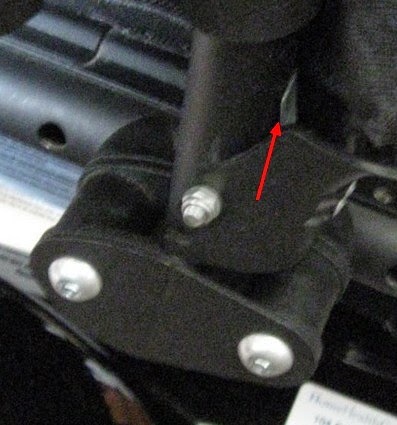 The other point of attachment is in a 'multi-component' latch point nearer to the front of the seat pan frane. The single square post allows the arm rest to twist. 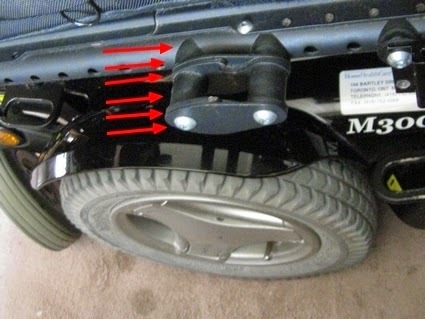 The attachment points at the seat pan/frame are both responsible for the large degree of side to side play of the arm. I remedied the problem to some degree by purchasing some large washers from the local hardware supplier. The larger radius helped somewhat but can't cure a poor design. (Above) Why go complex when simple is better? This photo shows the complex hinge mechanism at the arm's rear attachment point. A knurled knob, a thin tin sliding mechanism and a chrome coloured latch. Not sure what each is specifically for though I have played with each. A simpler, more effective and stable mechanism would suit this chair better. After all, it is basically a hinge to raise and lower the arm. The KISS principle - Keep It Simple Stupid.!!! The red arrow points to the larger washers I added to provide additional support. Note: the amber side reflectors are a practical feature for this chair -all around reflectors do provide visibility in the dark even if lights are not operational. (Above) This photo shows the forward attachment point of the arm. When the are swings down from the rear hinge, the post drops into the center of this mechanism and latches. The multi-component assembly of this 'catch' seems excessive for its intended purpose. A catch cast or machined from metal makes more sense to me. Red Arrows from top to bottom: (1) Spacers -scalloped to attach to the tubular frame and flat on the opposite side whee it meets a somewhat oval shaped metal plate (2). This plate lies flat against an almost identical plate (3), which has a notch for the latch to catch. (4) Short tubular spacers which are the diameter of the arm tube which it will receive and latch on to when lowered. (5) (6), the same as (2) & (4) in reverse. Six components X 2 (front & back) plus two bolts and nuts (front & back) to secure the mechanism to the chair frame. That's 16 separate pieces of hardware to make up the front arm catch (one per side). (Above) Photo shows the arm "nested" in the catch. The Red Arrow points to a thin metal spring which provides the "springiness" or tension needed to lock the arm in the catch. This mechanism is intended to lock the arm in place and keep it secure, however I have found that sometimes several attempts have to be made before the latch catches and locks. The spring itself is no thicker than the walls of a soup can. A simpler design with a coiled spring would be more effective. The two silver bolt heads visible on the outside plate are what I'll discuss next. Okay, the arms are flimsy, moving side to side with up to a 2" or 5 cm total displacement. So every time I lean on an arm, brace myself against it, or push on it to stand up, or use it to transfer, the arm is pulled or pushed to it's extreme position. Repeated "wobbles" from side to side appear to score or etch a mark around the circumference somewhere along the length of the bolt. Just like cutting glass, you score a line to weaken the glass/metal and then you snap it along this defect you created. Or perhaps it is simply repeated flexing -micro bends, which weaken the metal. That's what this design allows to happen to the bolt. If you use the arm for anything but daintily resting your wrist upon it, the bolts will break! Now, the bolts have broken numerous times in the past and on each occasion, after a few swear words, I went down to my local hardware supplier and purchased replacement bolts, of even a higher tensile strength. Still the poor design has them break. On the last occasion the bolt had broken without my notice. It decided to fall apart while riding on a transit bus. The bus driver saw the parts rolling around under the chair and handed what he could to me. It wasn't until I reached home that I realized the bus driver had not retrieved all my parts as the rolled about on the floor. I was missing the crucial spacer between the plates. I suppose I could try to sandwich a number of washers together to make up the distance, but I was fed up and after much difficulty, sent it to the shop (more on that later too). (Above) This short video clip shows the amount of play in the arm which still exists after my adding extra larger diameter washers to stiffen the hinge attachment point. The wobble will eventually weaken the bolts and cause them to break. A broken bolt may result in the spacer being lost as happened to me. A paraplegic relies on his arms for support and transfer. The wheelchair arms should be able to stand up to this amount of stress without major damage! 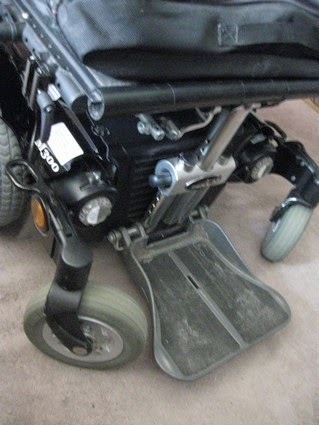 (Above) Photo shows the Permobil M300 arm Assembly. The cushioned Arm Rest (AR) is supported by a square post (P) which allows for height adjustment. The square post is attached to a curved arm (A) which is hinged at the rear of the chair and latches in the catch mechanism (discussed in previous photos). The entire arm mechanism does not provide a usable surface on which to attach a bag, pouch or other such container in which you can secure your personal property (wallet, keys, etc.) that may not be safe in a backpack hung on the back of the chair. My solution was to remove the arm cushion and sling some straps over the bar supporting the arm cushion, then re-attaching the arm cushion, thereby sandwiching the straps between the bar and the cushion. The straps can be stitched to a zippered bag, which I found in a local hardware store. (Above) Difficult to see but there are two straps (1), forming loops, which extend from the zippered bag and loop around the metal tube which supports the arm cushion. The cushion is removed by loosening two screws underneath, then replaced sandwiching the strap material in between. 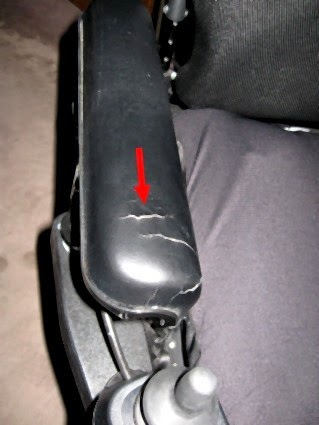 (2) Points to premature cracks developing in the faux-leatherette material covering the spongy arm rest. Cracks after a year and a half of normal use for a chair that is intended to last 5 years before replacement. This chair was not built to last! (Above) Another view of the cracks developing in a chair just two years old. I have to ask, if this was happening to your two year old car seat, or your living room sofa, would you consider your item well built. Is this really what we should come to expect of today's "quality"??? Am I alone in thinking, that things should last longer? 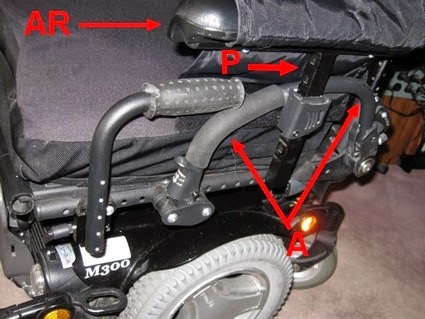 (Above) This photo shows two solutions, one mine, one the wheelchair service company's. 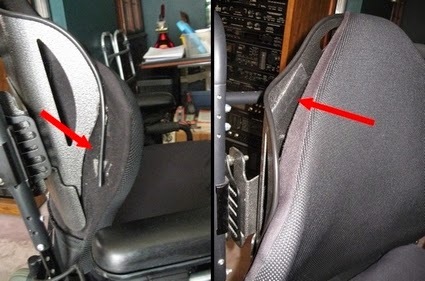 (1) shows my solution for the left side of my chair. 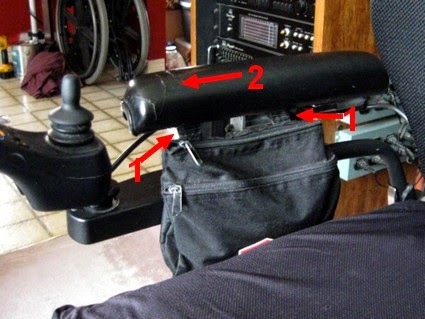 Again a bag is sandwiched, as described above, in order to provide some storage capacity to my chair. This bag happens to be the one that came off of my old Quantum power wheelchair. On the Quantum, the bag slings over one bar and is held by velcro after going around a second bar. This provides a secure storage compartment which can be easily removed for cleaning etc. The people at Permobil haven't given this storage issue much thought. 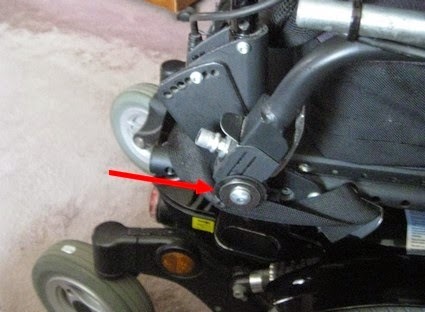 (2) Shows the solution my current wheelchair service provider came up to prevent broken bolts in the arm attachment mechanism. The solution, arrived at without my consultation, was to just not use the arm for transfers. A second bar with a grip is shown. Attached directly to the frame, it is suppose to offer better stability with less flexing and therefore should not break, at least not as rapidly. This seems to work well except for two issues. Firstly the new transfer arm blocks the old arm from being raised. The new transfer arm (2) must be removed before the original arm can be raised. This is not a major issue with me as I generally transfer without having to raise the padded hinged arm. The other problem is that the new transfer arm is lower than the original arm. If you want to raise yourself up (and over), it is difficult to raise up by grabbing onto something lower or at the same height that where you are currently at. Regardless, it does seem to work for me. 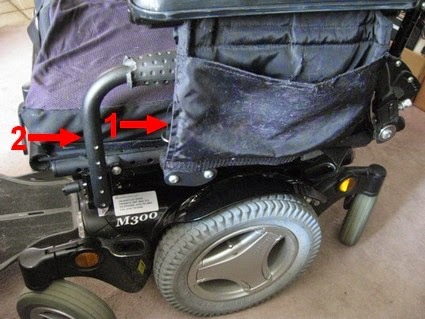 Unlike my old Quantum wheelchair which had a one piece cushion back, with the rigid frame sandwiched in the cushions, my Permobil has a plastic? or fiberglass frame to which the cushion is attached by double-sided sticky tape and velcro. In less than a year the tape dries up, releasing the velcro and the cushion. Cheap!! The protective band which covers the edge of the frame is also unraveling. Not major problems, but annoyances. Quality would not show this deterioration so soon after purchase and after reasonably gentle use. (Above) The canes quickly deteriorated in appearance. The cushion covering of the cane handle to the right was quickly shredded as the one seen on the left. This was from my repeated slinging a backpack over the handle and perhaps understandable. The left one has never been used for this means, nor have they ever been used for pushing the chair. Why it too is falling apart is beyond me. Note too that the plastic end caps, covering the rough, if not sharp metal tubing. I have had people run after me with plastic caps, bolts and screws in hand -telling me these have fallen off my chair. Quality workmanship? 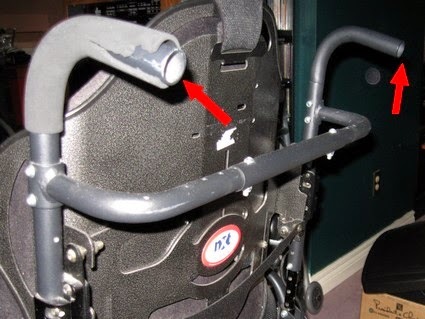 How much more would it cost to put a proper dense rubber handle covering on the cane or a metal end-cap secured with with set screws? Manufacturer be warned! Your product is your most effective advertising. A sloppy looking product is equally effective advertising -of your company's lack of concern and dedication to cutting corners. The reason a chair has a moveable footrest is to allow one to put their feet on the ground when not in motion. This is more comfortable while sitting at the same place for extended times. What I discovered was that the bare set screws would catch the back of my shoe's heels and nibble & tear at the rubber/leather. The screws protrude out from the chassis a per-determined distance and act as a 'stop' to hold the footplate at the proper angle when lowered. However, the bare screw heads act as tiny hooks, grabbing onto any edge and when the chair or foot is moved, a piece of the shoe can be removed. To solve the problem, or at least reduce it, I cut a section of flexible pipe to just over half it's curvature and punched holes for the screws to protrude through. The dense rubber hose backs up closely to the screw heads and there is no longer the edge beneath the screw head and screw shaft that can catch the shoe's sole material. There has been much less damage since installing this. (Below) That same dense wall pipe was split along it's length and added to protect the thin metal edge of the forward seat pan. While I can stand, I have to brace against something solid like my chair. The seat pan would cut into the backs of my legs until I came up with this solution. The hose was acquired from the local home hardware store and is nothing more than a hose section sold as an extension for washing machines to drain their used water into the laundry basin. It can be split with a utility knife (careful) and held in place using duct tape or, as I used, black electrical tape which more aesthetically pleasing. (Above) Split rubber pipe leg guard. Also the rather elaborate foot support mechanism in the lowered position. Permobil M300 - Large 7"+ wheels are standard and vendor claims that they are superior in climbing high curbs and driving over stones & other obstacles. I have to wonder if this is a necessity for most users. Unless you live in the country or some other undeveloped area, your town probably has ramped access to sidewalks and you have no need to drive over rocks or excessively high door thresholds, etc. I have found these off centered wheels, where the center of the wheel extends past the post to which it is attached, to present there own problems in comparison to smaller castors which are closer to the center of the supporting post. 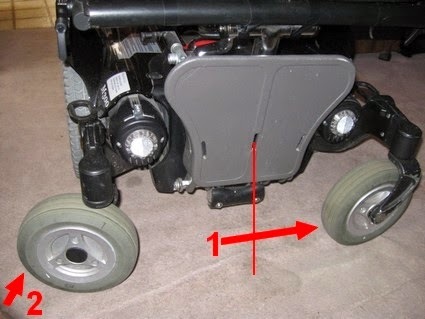 (1) shows how much the wheel comes into the center of the chair. The purpose of a footrest is that you can use it for support when driving longer distances but to place your feet on the ground when stationary. (As I can lift my legs, I often just raise them if travelling short distances.) The problem with these larger, off centered wheels is that depending on how you've parked, often one wheel is pointing inwards, minimizing the area where you can place your feet. 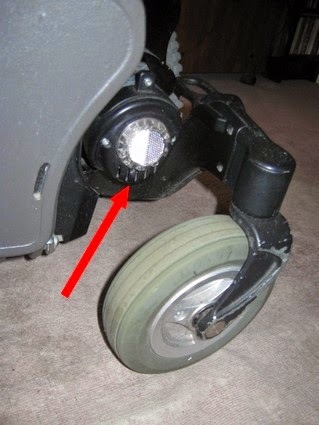 (2) The other wheel, depending on your approach, may point outwards. I have opened cupboards only to hit the extended wheel with the door and have it bounce back shut. Is it a major problem? No, of course not but it can be a nuisance. I have found that smaller castors are preferable to indoor & "civilized" areas. Consider this when purchasing any chair. One last problem: The batteries died on the Permobil M300 after about a year and a half of use where my Quantum's batteries lasted for a full seven years. More on that in another post. All that said, the Permobil M300 has run without incident since I've had it. To date, it has always gotten me to where I am going. But then I expect that from any make an model from any company. 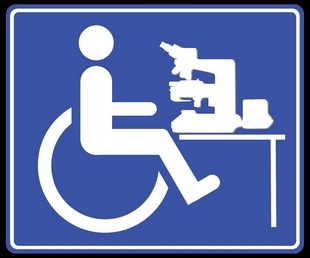 November 23rd, 2016: An anonymous comment to this post suggested I purchase a 'Corpus' Seat, not a 'PS' Seat from Permobil to eliminate my seating problems. I paid good money to a well regarded seating specialist to match my needs to the seating cushion if that is what the commentor is referring to. The Permobil seat pan and single pedestal attachment to the frame was the only option I was offered by the Permobil sales representative. As this was only my second powerchair, the first chosen by Lyndhurst hospital, I was a disabled novice and relied on other, so called "professionals" to make the proper choices on my behalf. Any confusion between the reflectors and lights again lay with the Permobil sales representative and the explanation offered. Their sales representative outright lied to me on another issue and perhaps the headlight/lighting issue was also misrepresented in order to make the sale. 2017: Further explanation regarding the reflector vs lighting system: The clear plastic 'lens' (for lack of a better name) on the front of the motors appear to have facets to produce reflection and are therefore, no doubt, reflectors. At the time I was considering purchasing this Permobil M300 powerchair, there were two persons offering descriptions of the item. One was the Permobil Manufacturer's Sales representative and one was from Shopper's Home Healthcare, the actual vendor of the product. On my inquiry, one of them distinctly stated that those lenses were "Head Lights" and they could be "turned on" for about an additional $1000.00. I accepted the statement on their word thinking that LED lights are extremely compact and the reflective lens could be exchanged for a clear 'focusing' lens; a headlight. My issue remains that this was not true. If this statement was offered by Permobil's company representative, it was an outright lie. If offered by the vendor's sale's person who was in honest error, the company representative said nothing to correct her. I clearly recall the description of the "headlights" but not who offered it. The lights, as I now understand it, are a completely separate "add-on" unit and have nothing to do with the clear reflectors on the front of the drive motors. Make sure you get a Corpus seat from Permobil and not the PS seat. You won't have all these issues, and Permobil is still the best, despite inherent weaknesses. The lights you are referring to are reflectors. The lights look identical to your reflectors on the back, but the lights are wired, your reflectors are not. The front reflectors are not even where your lights would be, had you purchased them. Front lights are mounted on top of the caster arms. The reason there are light switches on your joystick, is if you had them, not because they are pre-wired and just need turned on. The Corpus 3G seating is excellent and the armrests fully support my 200+ pounds when I adjust myself. 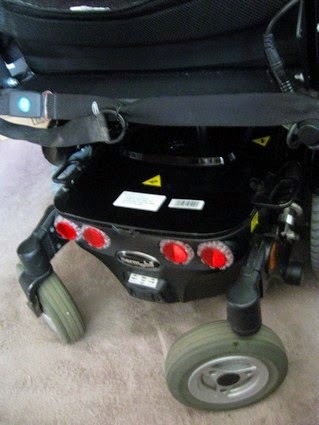 The light kit fully replaces the reflectors on your chair. It includes the lights and a wiring harness, plus an RNet or Pilot+ joystick. It sounds like they didn't order your chair with the light kit at all but instead just gave you the upgraded joystick for the appearance of the light kit. This is not only stupid, but shady! They might have done that to make the chair appear as though it had the light kit? That's my guess. I take it your insurance has replaced your seating system by now. For the future, avoid permobil. Sunrise Quickie QM710 with a sedeo ergo seat is what you want and need.